who's spying on who now? It doesn't look like much untill you know that I never drew a tree in my life. I actually typped "I PSY" first, freudian slip. this is my 10th IllustrationFriday, aka return of the wacom scratching kid. 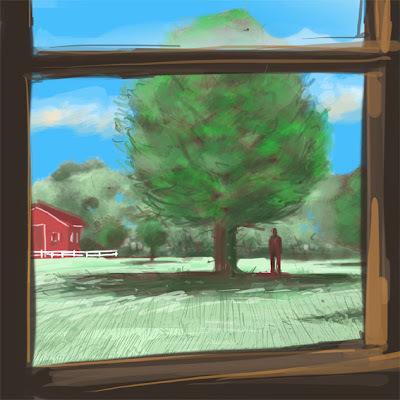 A few years ago, one of my artschool teatchers told me I made "american skies". And now off for my early spring motorcycle boots hunt. I like very much your tree and his shadow.Very interesting interpretation of the topic! I really like the composition through the window. Very nice piece. Very good job on your 1st tree. I think it is better than any damn tree I have drawn. Nice work. I really like this piece. Love how you have created a loose feel to it, yet at the same time there is an energy about it as well. Love it! I really like this piece. It is abit unnerving to me. Maybe the dark stranger thing of Jung's archetypes but still..disturbing..great tree btw, and never mind about someone else's opinions of skies. what is it with people, trying to fit everyone in a square hole. cheers. appreciate your take on the subject. Sometimes the watcher is also being watched... who is being watched.... who is being watched watching.